Set among the vineyards, the luxurious Domaine de Verchant, near Montpellier, offers you a 360-degree view of the grape vines and a chance to taste their high-quality wines. A few minutes from the centre of Montpellier, the Domaine de Verchant offers you an enchanting stay at the heart of the 17-hectare vineyard. Two lines of oak and pine trees will lead you to an elegant mansion, renovated in 2007 into a prestigious five-star hotel. 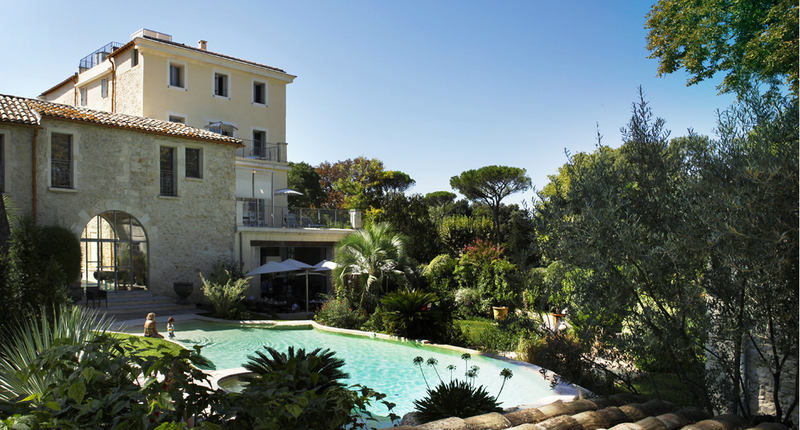 The hotel, restaurant, spa, pool and ‘beach’ offer magnificent views of the Languedoc vineyards. At this unique and exceptional site, part of the Relais & Chateaux group since 2013, the hotel, restaurant, spa, pool and ‘beach’ offer magnificent views of the Languedoc vineyards and the landscaped park. You can relax and take in the scents of the south, but also, at any time of year, enjoy the spectacle of the grape vines which produce rosé, white and red wines. You can also taste the wines at the restaurant, which serves Mediterranean cuisine. The young owner of the Domaine de Verchant has conferred the running of the vineyard to professionals capable of bringing out the best of this exceptional wine-growing area. In this soil characterized by rounded pebbles, typical of the origin-approved (AOC) Méjanelle wine district, the wine growers, under the Mediterranean sun, benefit from the influence of the mistral winds and sea breezes. The ancient grape vines are next to those which have been planted more recently. Roussanne has been added to the traditional Merlot, Grenache and Syrah vines. A moderate weeding of certain plots is undertaken to improve production and assure the health of the wines, guaranteeing an excellent harvest. The grape harvest is done by hand, in crates. The grapes are sorted, destalked and then lightly pressed before being put into vats. The stainless steel vats, kept at a constant temperature, or the oak casks, allow for the production of high-quality red and rosé wines. Thanks to the strict control of the fermentation process and slow maturing in the vats, the aromas and flavours of the grapes are gently extracted. Three reds with complementary characters, a special rosé called ‘Petal of the Rose’, and a white created in 2005, form the characteristic range of the Domaine de Verchant wines, which you can discover in the wine cellar.